Outstanding on this year’s ITTF World Junior Circuit, the Indian trio comprising Manav Vikash Thakkar, Manush Utpalbai Shah and Snehit Suravajjala excelled as the initial group stage of the Under 21 Men’s Singles event came to a close at the 2017 Spanish Junior and Cadet Open in Almeria on Thursday 23rd November. All three finished in first places in their respective groups. The first place secured by Manav Vikash Thakkar, the player who leads the ITTF World Junior Circuit Boys’ Standings having won in India and Slovenia, was as to be expected. He was the highest rated player in the group; he concluded his initial itinerary by recording a straight games success against Austria’s Thomas Grininger (11-9, 11-4, 11-7). However, the top spots gained by Manush Utpalbhai Shah and Snehit Suravajjula were contrary to expectations. 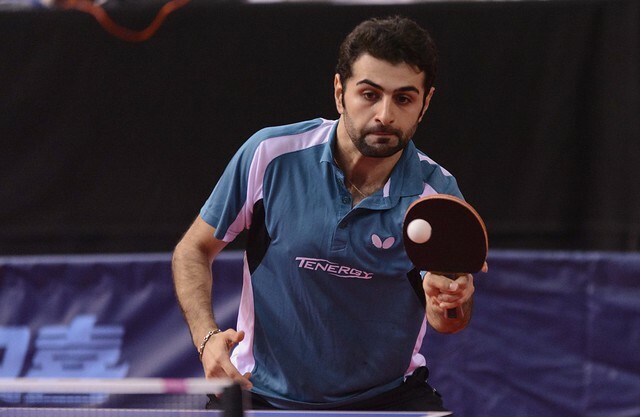 Semi-finalist in this year’s ITTF World Junior Circuit in India and Serbia, Manush Utpalbhai Shah beat Gleb Shamruk of Belarus (12-10, 12-10, 2-11, 11-7) to secure first place in his group; likewise Snehit Suravajjula, successful in Jordan, accounted for Turkey’s Abdullah Yingeler (12-10, 6-11, 11-5, 11-3). Presently on the Under 21 Men’s World Rankings, Manush Utpalbhai Shah is listed at no.198, Gleb Shamruk at no.108; Snehit Suravajjula is at no,185; Abdullah Yingeler at no.117. Success for three Indian players still in the junior ranks, there was also success for the slightly older Arjun Ghosh, now 21 year of age; the leading player in his group, he concluded his initial phase matches with victory in opposition to Italy’s Luca Bressan (11-9, 11-5, 11-5). Top spots for four players from India; there was almost one more, by narrow margins Rohit Bhanja, the highest rated in his group had to settle for second spot.. On the opening day of play he beat Spain’s Rafael de los Heras in four games (8-11, 11-7, 11-7) but in his concluding group phase engagement, he was beaten in five games by England’s Luke Savill (11-7, 7-11, 11-13, 4-11, 11-8). Notably the previous day, Luke Savill had suffered a straight games defeat at the hands of Rafael de los Heras (11-6, 11-7, 11-6). Thus games ratio determined the outcome; it was first place for Rafael de los Heras (4:3) followed by Rohit Bhanja (5:4) and Luke Savill (3:5). Problems for the leading players in the respective groups and there were more. Switzerland’s Lionel Weber, the top named player on duty, was beaten by Spain’s Carlos Caballero (12-10, 8-11, 11-5, 11-6). Likewise, Belgium’s Thibaut Darcis lost to Italy’s Jordy Piccolin (6-11, 11-9, 13-11, 11-8), Sweden’s Anders Eriksson was beaten by Germany’s Nils Hohmeier (11-9, 11-13, 11-9, 15-13). Also from Sweden Oscar Perman was beaten by the host nation’s Joan Masip (6-11, 6-11, 11-5, 11-8, 15-13). Surprises but not for Germany’s Denis Klein and Romania’s Alexandru Manole; the highest rated players in their respective groups, top places were duly secure. Players finishing in first places in each of the 11 groups plus five “Lucky Losers” draw at random from those finishing in second positions, join the 16 seeds in the main event.